Draft: 2007, Tampa Bay Devil Rays, 12th rd. He and his wife, Alyssa, have one daughter, Payton, and two sons, Clark and Bennett...Graduated from Central Valley (CA) Christian High School...also played basketball while at Central Valley...Attended Azusa Pacific University located near Los Angeles in Southern California... His father, brother, two uncles and cousin all played baseball at the college level...Enjoys golf, salmon fishing and duck hunting...Grew up an avid Giants fan and drove with his family from his Visalia home several times a year to watch Giants games at Candlestick Park...his two favorite players were Will Clark and Barry Bonds. Missed most of the season after undergoing right shoulder surgery in May...Appeared in three games with double-A Biloxi from May 2-5 before his season ended. Batted .233 with 12 HR and 40 RBI in 99 games between Oakland and Milwaukee...Made 76 starts (69g at C, 7g at DH)... His teams went 34-35 in his starts behind the plate, including 20-13 with the Brewers... Posted a 4.31 catcher's ERA (585.1ip, 280er), including 3.13 with the Brewers (273.1ip, 95er)...Threw out 3 of 66 runners attempting to steal (4.5%), including 1 of 28 with the Brewers (3.6%)... Batted .217 with 4 HR and 20 RBI in 54 games with Oakland before he was designated for assignment on 6/22.....made 43 starts (36g at C, 7g at DH)... Was claimed off waivers by Milwaukee on 6/25... Batted .254 with 8 HR and 20 RBI in 45 games with Milwaukee.....made 33 starts, all at catcher... Belted 2 HR and drove in all 3 runs in a 3-2 win on 6/30 vs. Miami.....was his home debut for the Brewers and his third career 2-homer game... Smacked his first career pinch-hit homer on 8/23 at San Francisco (solo shot off Sam Dyson)... Was on the 10-day disabled list from 7/18-8/17 with a left knee sprain.....suffered the injury on while applying a tag at the plate on 7/17 at Pittsburgh... Started 9 consecutive games from 9/21-9/30 (Manny Piña injury)...Signed a 1-year contract on 12/1, avoiding arbitration. Played in a career-high 137 games and hit .251 with 14 home runs and 56 RBI…also had career bests in at bats (490), hits (123), doubles (30) and extra base hits (46)…was named to his second consecutive American League All-Star team…made 109 of his 125 starts against right-handed pitchers…batted .264 (105-for-398) with 13 of his 14 home runs against right-handers compared to .196 (18-for-92) against left-handers…has hit 41 of his 45 career home runs against righties…was batting .277 at the All-Star Break but then hit .222 after the break…now has a .285 (193-for-678) career average before the break, .226 (155-for-686) after the break…grounded into just six double plays and his average of 81.7 at bats per GIDP was eighth best in the AL…batted .311 with a .508 slugging percentage when leading off an inning…hit .198 with runners in scoring position, which ranked fifth lowest in the AL…went 1-for-9 (.111) with the bases loaded…connected for 10 of his 14 home runs on the road and 23 of his 32 home runs over the last two years have come away from the Coliseum…12 of his 14 home runs were solo shots and seven came with two strikes…25 of his 45 career home runs have come with two strikes…appeared in 113 games (103 starts) at catcher, 23 games (22 starts) at designated hitter and one at first base…batted .257 while catching, which was second best among AL catchers…ranked fourth among AL backstops in RBI (47)…hit .333 with three home runs and nine RBI as the DH…made 89 of his first 96 starts at catcher but 15 of his final 29 came as the DH…committed a career-high seven errors, which were third most among AL catchers…ranked fourth in games caught (113)…tossed out 13-of-64 (20.3%) attempted base stealers…went 1-for-10 (.100) as a pinch hitter and is 6-for-49 (.122) in his career…started games at every spot in the order from second through eighth and saw his most action with 51 games in the three spot…did not steal a base for the second consecutive season and his streak of 335 consecutive games without a steal is fourth longest in Oakland history…it is the longest since Scott Hatteberg went his entire A's career without a steal (569 games, April 1, 2002 to Oct. 1, 2005)…his only career steal came on June 30, 2014 at Detroit…batted .182 in interleague play and has a .217 (40-for-184) career average against the National League…had a ground ball to fly ball ratio of 0.73, which was the lowest in the AL and second lowest in the majors (Belt, SF 0.67)…his fly ball percentage of 42.8 was fourth highest in the AL. Was named to his first American League All-Star team as he batted .308 with 13 home runs and 53 RBI over his first 70 games through June 25…then hit .214 with five home runs and 18 RBI over his final 66 contests…had a .261 average, 18 home runs and 71 RBI in 136 games overall…led the A's with 56 walks and a .341 on-base percentage…had a .277 batting average while catching, which led AL catchers and ranked fifth in the majors…ranked fourth among AL catchers in home runs (17) and RBI (61)… the home runs were fifth most in Oakland history by a catcher and the most since Ramon Hernandez had 21 in 2003…started 89 games at catcher and 20 at first base…committed just three errors behind the plate and his .996 fielding percentage was third best in Oakland history by a catcher (Miller, .999 in 2004; Steinbach, .998 in 1994)…tossed out 15-of-58 (25.9%) attempted base stealers…made 34 of his first 35 starts at catcher but just 55 of his last 80…hit .268 (90-for-336) with 17 of his 18 home runs against right-handed pitching compared to .239 (26-for-109) against left-handers…slugged .479 against righties, .330 against lefties…has hit 28 of his 31 career home runs off right-handers…13 of his 18 home runs came on the road…had a .316 average with runners in scoring position…batted .303 in the seventh inning or later, which ranked 10th in the AL…was 3-for-15 (.200) with five walks as a pinch hitter… tied for the AL lead in pinch walks…is now 5-for-39 (.128) with nine walks in the pinch in his career… was 3-for-12 (.250) with the bases loaded, but two of the hits were grand slams, which tied for second in the AL…tied for seventh in the AL in sacrifice flies (8) and ranked eighth in pitches per plate appearance (4.11)…had the sixth highest line drive percentage (27.2%) and the seventh lowest percentage of swings at the first pitch (15.3%)…made a team-leading 44 starts batting fifth…hit .299 with 11 home runs and 34 RBI in 47 games overall from the five spot…started games in every spot in the order except first, eighth and ninth. Began the season at Triple-A Sacramento but was promoted to Oakland June 1 and spent the remainder of the season with the A's…batted .279 with nine home runs and 35 RBI in 84 games with Oakland…hit.361 with five home runs and 23 RBI over his first 44 games through July 28…then batted .180 with four home runs and 12 RBI over his final 40 contests…started games at ve different positions, including40 at first base, 13 in right field, eight at catcher, five at designated hitter and one in left field…made 61of his 67 starts against right-handed pitching…batted .291 (67-for-230) against right-handers comparedto .205 (8-for-39) against left-handers…four of his eight hits against lefties were for extra bases (two doubles, one triple, one home run)…has made 100 of his 107 starts with the A's over the last two years against right-handers…has a .262 (97-for-370) career average against righties, .203 (12-for-59) against lefties…hit eight of his nine home runs against right-handed pitchers…eight came in night games and seven were hit with two strikes…has hit 10 of his 13 career home runs with two strikes…had a .305 bat-ting average in night games…hit .343 in June and .357 in July but then batted .212 in August and .121 in September…committed two errors, both in his 47 games as a first baseman (.995 fielding percentage)…did not make an error in 15 games behind the plate and tossed out the only two baserunners attempting to steal off him…has thrown out 11-of-31 (35.5%) attempted base stealers in his career…hit .388 in 18 games as an outelder, .261 with six of his nine home runs in 47 games as a first baseman, .273 in sixgames as the designated hitter and .242 in 15 contests at catcher…was also 2-for-12 (.167) as a pinch hitter and is now 2-for-24 (.083) in his career…started games at every spot in the order except leadoff…made his most starts batting sixth (24). Was acquired from Tampa Bay on April 5 for cash considerations and spent most of the season at Triple-A Sacramento where he was named to the Pacific Coast League Postseason All-Star Team at catcher…also had two stints with the A's and batted .252 with four home runs and 16 RBI in 47 games…made 39 of his 40 starts against right-handed pitching…hit .256 (34-for-135) with three of his four home runs, 15 of his 16 RBI and all nine of his walks against right-handed pitchers…was 4-for-18 (.222) against lefties…batted .357 on the road compared to .177 at home…however, hit three of his four home runs in Oakland… had a .350 batting average with runners in scoring position and two outs…all four of his home runs came off a pitcher the first time he faced him in a game…appeared in 44 games, including 40 starts, at catcher and committed just one error for a .997 fielding percentage…tossed out 8-of-28 (28.6%) attempted base stealers and has now thrown out 9-of-29 (31.0%) in his career…the A's went 27-13 (.675) in his starting assignments behind the plate…went 0-for-4 as a pinch hitter and is now 0-for-12 with two walks in the pinch for his career…made 21 starts hitting eighth, 16 hitting ninth and three batting seventh. OAKLAND: Was recalled from Sacramento for his first stint June 25 and started each of the A's next three games at catcher…had a sacrifice fly in his first at bat as an Athletic June 25 against Cincinnati, his first career RBI…snapped a career-opening 0-for-32 streak with a home run in the fourth inning June 28 against St. Louis off Joe Kelly…the hitless streak was the second longest career-opening hitless streak by a non-pitcher since 1973 (Chris Carter, OAK; 33 in 2010)…was 2-for-13 (.154) in four games, all starts at catcher, when he was optioned to Sacramento July 4…returned to Oakland July 25 when Jaso went on the DL with a concussion and spent the remainder of the season with the A's, batting .262 with three home runs and 14 RBI in 43 games, including 36 starts…started 16 of the A's 22 games at catcher from July 26 to Aug. 14 and tossed out 7-of-15 (.467) attempted base stealers…had his first career multiple hit game July 26 against Los Angeles (AL) when he went 2-for-4 with a home run and two RBI…was batting .188 over his first 11 games through Aug. 3…then hit .309 over a 27-game stretch from Aug. 4 to Sept. 14…made his only start against a left-handed pitcher Aug. 12 at Toronto (J.A. Happ)…had a career-high eight-game hitting streak from Aug. 23 to Sept. 5…went 10-for-29 (.345) during the streak, which ended Sept. 6 against Houston when he lined out as a pinch hitter…doubled twice in a game for the first time in his career Sept. 4 against Texas…went 3-for-6 with a home run and three RBI Sept. 11 at Minnesota…the hits and RBI were career highs…went 3-for-22 (.136) over his final nine games…started all five games at catcher in the ALDS against Detroit and went 3-for-16 (.188) with seven strikeouts…one of the hits was a "walk-off" RBI single in the bottom of the ninth inning in Game 2, a 1-0 win…it was the eighth walk-off win in Athletics postseason history…according to the Elias Sports Bureau he is the first rookie with a game-ending RBI in the postseason since Jed Lowrie for Boston in Game 4 of the 2008 ALDS…it was the first walk-off RBI in Major League postseason history by a rookie catcher. SACRAMENTO: Was assigned to Sacramento following the trade and batted .324 with 13 home runs and 58 RBI in 75 games with the River Cats…added 21 doubles and three triples for a career-high .547 slugging percentage…his 38 walks fueled a .398 on-base percentage…hit .338 (78-for-231) with 12 of his 13 home runs against right-handed pitching compared to .277 (18-for-65) against left-handers… batted .375 with runners in scoring position and two outs, .362 during the day and .355 in the seventh inning or later…was 4-for-8 (.500) with two home runs and 17 RBI with the bases loaded…tossed out 25-of-61 (41.0%) attempted base stealers…has thrown out 80-of-224 (35.7%) in his minor league career…appeared exclusively at catcher on defense with 65 games…committed two errors for a .997 fielding percentage…also hit .282 in nine games at designated hitter and was 0-for-1 as a pinch hitter… hit in every spot in the order except first and eighth…saw his most playing time with 25 games in the five spot…had six home runs in 19 games batting third…hit safely in each of his first 13 games from April 7-21, which was his longest hitting streak of the season with the River Cats…went 29-for-56 (.518) with 16 runs, six doubles, two triples, four home runs, 17 RBI and 10 multiple hit games during the streak…had a .911 slugging percentage and also walked six times for a .565 on-base percentage… reached base safely via hit or walk in each of his first 20 games (.429 batting average, .484 on-base percentage)…reached base safely in 31 consecutive home games from April 7 to July 12, which was the second longest streak in the Pacific Coast League in 2013…hit .344 with a .420 on-base percentage during the streak…went 5-for-6 with four runs scored, a triple, two home runs and six RBI April 14 at Reno…the hits, home runs and RBI were season highs…hit his first of two grand slams in the game… hit .438 in April, which was the best mark in all of the minor leagues in the first month of the season… tied for third in the PCL with six home runs in the month…went 6-for-42 (.143) over his first 11 games in May…then had a nine-game hitting streak from May 16-30 (12-for-34, .353)…had his second of three two-homer games May 28 against Salt Lake…finished May with a .228 batting average in 22 games but then hit .306 in June…went 3-for-5 with five RBI June 23 against Colorado Springs…was batting .325 with nine home runs and 43 RBI in 59 games when he was recalled by Oakland June 25…was optioned back to Sacramento July 4 and hit .323 with four home runs and 15 RBI over his final 16 games with the River Cats…matched his season high in runs (4), hits (5), home runs (2) and RBI (6) and also hit his second grand slam July 19 at Salt Lake…was named PCL Player of the Week for the week of July 15 to 21 after going 11-for-18 (.611) with seven runs, two doubles, three home runs and 11 RBI in four games in the shortened week after the All-Star Break…returned to Oakland July 25 and spent the remainder of the season with the A's…was fifth in the PCL in slugging (.547) and seventh in batting (.324) at the time of his promotion. Saw his first major league action over three stints with the Rays and made the Opening Day roster...appeared in 18 games including four starts (3-DH, 1-C)...also appeared in two gamesin LF...spent the remainder of the season with Triple-A Durham...Went hitless in 25 at-bats, the longest hitless streak to start a major league career in franchise history...is one of two players since 1990 to go hitless through his first 25 career at-bats, joining OAK Chris Carter in 2010 (0-for-33)...since 1900, the longest hitless streak to begin a career by a position player is 0-for-43 by SS Chub Aubrey of the Boston Beaneaters in 1903...Optioned to Durham on April 20 as B.J. Upton was activated from the disabled list...joined the Rays again on May 14 when Desmond Jennings went on the DL, but was returned to Durham on May 29 when Hideki Matsui was added to the roster...promoted again on Sept. 5...Threw out the only base runner who attempted to steal, Jacoby Ellsbury on Sept. 17 vs. BOS...Drew a pair of walks, both as a pinch-hitter in the ninth inning in September...on Sept. 15 at NYY received a free pass from RH Rafael Soriano...on Sept. 20 vs. BOS, walked against RH Andrew Bailey to load the bases during a six-run rally en route to a 7-4 walk-off victory, capped by B.J. Upton's walk-off, three-run homer...Named the winner of the 2012 Al Lopez Award as the Rays most outstanding rookie in spring...hit .323 (10-for-31) while appearing at four positions: C, 1B, LF and RF as well as DH...Hit .272/.350/.424 (95-for-349) with nine HR and 43 RBI in 94 games for Durham...split time between C (37 games), LF (23), 1B (16), RF (12) and DH (12)...batted .303 (71-for-234) with five HR vs. RHP compared to .209 (24-for-115) vs. LHP. Named Rays Minor League Hitter of the Month in June after hitting .364 (39-for-107) with five HR, 19 RBI, six doubles and 24 runs scored. Was named Rays Minor League Player of the Year...split the season between Double-A Montgomery and Triple-A Durham with a July 27 promotion...combined to bat .298 (152-for-510) with 17 HR, 35 2B and 105 RBI...Over 128 games, made appearances at catcher (50), left field (48), designated hitter (20), first base (13) and right field (2)...His 105 RBI led the Rays organization and ranked as the 11th-highest total in the minors...it was the 4th-highest total in Rays minor league history...Finished 6th among Rays minor leaguers with a .298 average...had career highs in hits (152), triples (7) and doubles...hit 17 HR after entering the season with 18 HR over his previous 4 seasons combined...Opened the season with Montgomery and batted .301 (116-for-386) with 13 HR and 85 RBI in 97 games...was named Montgomery's MVP and a mid- and postseason All-Star in the Southern League...despite his call-up, ranked 6th in the SL in RBI and 9th in batting avg. and SLG (.487)...Hit .368 (43-for-117) with runners in scoring position and .462 (18-for-39) with RISP and 2 outs...hit .253 (43-for-170) as a catcher and .337 (73-for-216) at all other positions...Hit safely in 21 of his first 24 games for the Bulls...Hit .364 (4-for-11) in 3 postseason games as the Bulls were swept by Columbus in the International League semifinals...Added to the 40-man roster on Nov 18. Led the Rays organization and won the Florida State League batting crown with a .345 (127-for-368) avg. for Class-A Charlotte...led the league with a .511 SLG...started the season as the backupcatcher and worked his way into the everyday lineup by also playing LF and 1B...hit .404 (21-for-52) inMay...recorded a club-record 17-game hitting streak from April 23-May 23...named to the FSL midseasonand postseason All-Star teams. Suffered a season-ending shoulder injury after playing just10 games with the Stone Crabs. Drafted in Juneand reported to Short-A Hudson Valley...hit .385 (47-for-122) in his last 34 games...batted .452 (19-for-42) with RISP and two outs. Inbox: More playing time in Sandoval's future? February 14, 2019 C Stephen Vogt assigned to Sacramento River Cats. February 12, 2019 San Francisco Giants signed free agent C Stephen Vogt to a minor league contract and invited him to spring training. 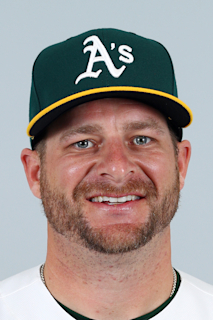 November 1, 2018 C Stephen Vogt elected free agency. October 31, 2018 Milwaukee Brewers activated C Stephen Vogt from the 60-day disabled list. May 8, 2018 Milwaukee Brewers transferred C Stephen Vogt from the 10-day disabled list to the 60-day disabled list. Right shoulder strain. May 2, 2018 Milwaukee Brewers sent C Stephen Vogt on a rehab assignment to Biloxi Shuckers. March 28, 2018 Milwaukee Brewers placed C Stephen Vogt on the 10-day disabled list retroactive to March 26, 2018. Right shoulder strain. August 18, 2017 Milwaukee Brewers activated C Stephen Vogt from the 10-day disabled list. August 15, 2017 Milwaukee Brewers sent C Stephen Vogt on a rehab assignment to Colorado Springs Sky Sox. August 11, 2017 Milwaukee Brewers sent C Stephen Vogt on a rehab assignment to Wisconsin Timber Rattlers. July 18, 2017 Milwaukee Brewers placed C Stephen Vogt on the 10-day disabled list. Left knee sprain. June 25, 2017 Milwaukee Brewers claimed C Stephen Vogt off waivers from Oakland Athletics. June 22, 2017 Oakland Athletics designated C Stephen Vogt for assignment. July 26, 2016 Oakland Athletics activated C Stephen Vogt. July 23, 2016 C Stephen Vogt roster status changed by Oakland Athletics. June 1, 2014 Oakland Athletics recalled C Stephen Vogt from Sacramento River Cats. May 12, 2014 Sacramento River Cats activated C Stephen Vogt from the 7-day disabled list. March 29, 2014 Oakland Athletics optioned C Stephen Vogt to Sacramento River Cats. July 25, 2013 Oakland Athletics selected the contract of Stephen Vogt from Sacramento River Cats. July 4, 2013 Oakland Athletics optioned Stephen Vogt to Sacramento River Cats. June 25, 2013 Oakland Athletics recalled Stephen Vogt from Sacramento River Cats. April 5, 2013 Tampa Bay Rays traded C Stephen Vogt to Oakland Athletics for Player To Be Named Later. April 5, 2013 Oakland Athletics optioned Stephen Vogt to Sacramento River Cats. April 5, 2013 Stephen Vogt assigned to Sacramento River Cats. March 31, 2013 Tampa Bay Rays designated Stephen Vogt for assignment. March 20, 2013 Tampa Bay Rays optioned Stephen Vogt to Durham Bulls. September 5, 2012 Tampa Bay Rays recalled Stephen Vogt from Durham Bulls. July 12, 2012 Stephen Vogt roster status changed by Durham Bulls. July 2, 2012 Durham Bulls placed C Stephen Vogt on the 7-day disabled list. May 29, 2012 Tampa Bay Rays optioned C Stephen Vogt to Durham Bulls. May 14, 2012 Tampa Bay Rays recalled Stephen Vogt from Durham Bulls. April 20, 2012 Tampa Bay Rays optioned Stephen Vogt to Durham Bulls. April 4, 2012 Tampa Bay Rays recalled Stephen Vogt from Durham Bulls. April 4, 2012 Stephen Vogt roster status changed by Tampa Bay Rays. March 18, 2012 Tampa Bay Rays optioned Stephen Vogt to Durham Bulls. November 18, 2011 Tampa Bay Rays selected the contract of Stephen Vogt from Durham Bulls. October 10, 2011 1B Stephen Vogt assigned to Leones del Caracas. July 28, 2011 Stephen Vogt assigned to Durham Bulls from Montgomery Biscuits. April 6, 2011 Stephen Vogt assigned to Montgomery Biscuits from Charlotte Stone Crabs. February 16, 2011 Tampa Bay Rays invited non-roster C Stephen Vogt to spring training. September 17, 2009 Stephen Vogt roster status changed by Charlotte Stone Crabs. May 7, 2009 Stephen Vogt roster status changed by Charlotte Stone Crabs.